Getting a residency is getting tougher every year. The current match rate for international (foreign) medical graduates is close to 45-50% every year. This rate is going to decrease not because there is a reduction is number of residency positions but because there is an incremental pattern to number of foreign medical graduates applying each year. For the unmatched applicants alternatives are an important aspect to consider. 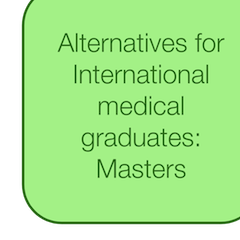 Here in, I discuss graduate school as an alternative for international medical graduates with specific focus on the Masters program. The next part of this article will focus on other less know masters programs and PhD programs. 2. As a permanent solution. As a temporizing measure, graduate school is useful for those who wish to be in US legally and productively. In between the application cycles and match outcomes, the applicant works in parallel on their masters program e.g. (3) Masters in health informatics (MHI). The downside of this option is that financial support is slim to non-existent and you will have to pay for tuition and all other incidental expenses. There are however, avenues for earning on campus (working in campus cafeteria, library or campus security) which can help with expenses but these jobs are few and applicants many. For most part, masters can be a costly process because tuition for out of state students is drastically higher. This is in contrast with a PhD program track where you are for most part eligible to receive full scholarship and some stipend in addition to waiver of tuition for completion of courses required for your training. Another drawback of degrees like MPH, MHA etc is that they have quickly lost their usefulness for residency application. Program directors and faculty have realized that very often, international graduates use masters programs to commence their residency application process. As a result, the value of these degrees in directly affecting the match or interview outcome is diminishing rapidly. As a permanent solution, master’s degrees fall short of delivering. The job market for an ECFMG certified non-clinical IMG who has done MPH or MHA is small. Unless, the applicant continues to further their CV with publications and projects getting a job is difficult in the current economy. Having an MD (even though from a foreign country) may offer a slight benefit but the margin is very small to be practically useful. Online resources are a great way to narrow some of the places and programs for getting masters degrees. Chose the program well, having a MS degree in public health from Harvard or Yale is better than doing it from a community college that is not as famous. Also, make sure you look at the faculty bio and check if the university has an IMG friendly residency program. The second condition often makes applying to a middle tier program (many on the east coast or Midwest) a better proposition than getting a degree from Ivy League colleges. Careful selection of university programs will make it easier to make connections in the program with the faculty, the program director and even the residents. You could even approach the program for an opportunity to do an observership and thus get exposure to US clinical medicine. Overall, this route has generally been successful for IMG applicants because of the high numbers of applicants using MPH or MHA indirectly to get a residency. Unfortunately, it likely was most effective about five to ten years ago but is quickly losing its novelty because a high number of IMGs are now using this to get a residency. Princeton review and gradschools.com have good resources regarding GRE and also offer courses. Part 2 and 3 of this series will deal with the choice of other masters programs or PhD as an alternative for international medical graduates who are interested in pursuing this as a primary choice or as an alternative for clinical practice. Does a Master's degree in Pathology help in getting a residency in Pathology? Hi! This is about MPH and MHA ..but what about MS in CLINICAL RESEARCH Or any of the BIOMEDICAL SCIENCES...? Will it give u more advantage than public health, when applying for residency?? There is no inherent advantage to doing MHA or MPH it just helps you connect with proper personnel and network. If you get into grad school for MS that would be alright too. Just make sure that you make most of your time here by working towards improving your chances. Are there any other good non-clinical fields where an MBBS graduate from India can study a Masters. Does these masters offer good job opportunities in USA. ?